Learn how to create Zombie Finger Food, two ways – zombie-style, or freshly-severed! 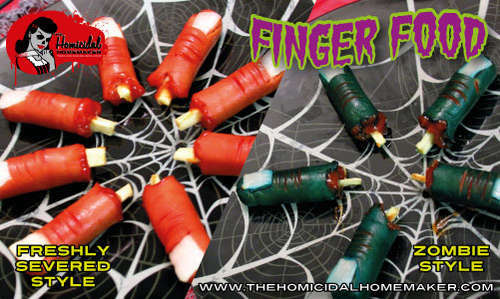 Ahh…Zombie Finger Food. The bon-bons of the undead! Step inside The Homicidal Homemaker’s kitchen (if you dare…) and learn how to create one of the easiest and most popular recipes on my website, Zombie Finger Food, two ways – zombie-style, or freshly-severed! Serve these as an appetizer with a side order of blood, er…ketchup, or throw a couple onto a hotdog bun for a ghoulish spin on a picnic favorite! You can make these Zombie Finger Food hotdogs as inexpensive or as gourmet as you prefer, depending on what type of sausage or hotdogs you use. This also works perfectly for vegans and vegetarians – simply substitute with veggie dogs, and use a parsnip or potato for the protruding bone! This was one of the first recipes ever published on TheHomicidalHomemaker.com. If you’d like to check out the original (more complicated) version of the recipe, click here!